Andrew Colabella is a lifelong Westporter. The 2007 Staples High School graduate worked for the town as a seasonal employee from 2004 to 2014. This year’s fireworks were far better than last year’s. Lasting 28 minutes, introducing shapes, emojis, the letters “USA” and a great big finale, Grucci — a 6th generation family with an expertise in pyrotechnics — gets an A+. Westport PAL quickly shut down a couple of vendors selling toy machine guns. Other vendors sold toys that lit up, cool hats and other stuff. Most importantly they brought back Michelle Pauker to the national anthem. She gave us chills that lasted into the fireworks. Another A+. Parks and Recreation, from guest services and clean-up crew to their supervisors opening the gate 30 minutes earlier than expected (causing little to no traffic), left patrons and visitors beyond ecstatic. Parking was fantastic. With 200 passes left unsold, foot travelers were copious. Carmen Roda, Rick Giunta, Jen Fava and Ed Frawley were on the ball, making entry and exit smooth. Their enthusiastic, hardworking crew of employees worked nonstop all morning, afternoon and into the night, to help everyone enjoy the show. Guest Services also get an A+. Parks and Rec operations supervisor Dan DeVito helped out by collecting fireworks tickets in the Soundview lot. The process was quick and easy. 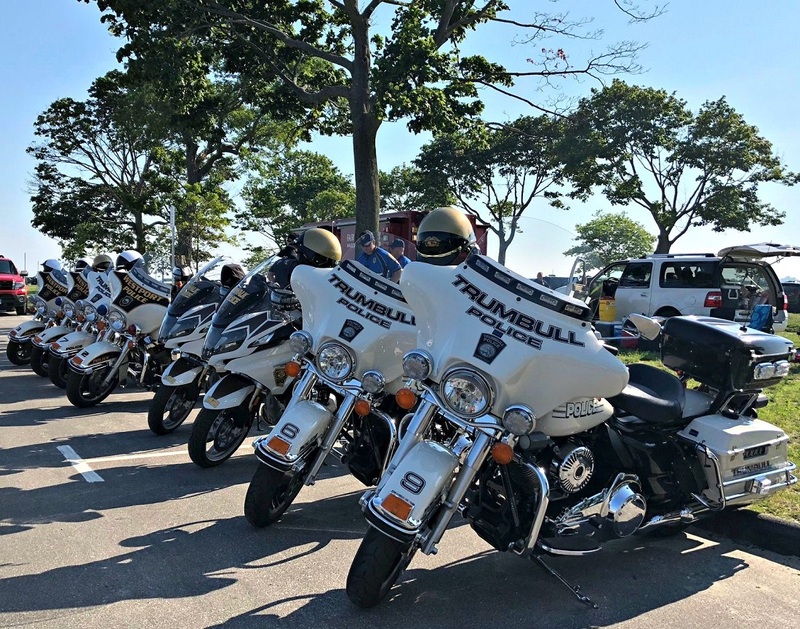 Police, fire, emergency services and mutual aid from other towns — including bomb-sniffing dog and officers patrolling on foot, bike and car — ensured that all was quiet. Another A+. Trumbull and Norwalk were among the towns providing support last night. Compo Beach lifeguards, dressed in their finest reds, offered first aid. Injuries were simple and few. A dozen missing children were returned to their parents. One husband was reported missing by his wife. Jonathan was found. (Sorry Jonathan 😂) A+ again. Joey’s by the Shore employees were on target with their meals and services. Cleanliness was stellar. I can still taste the food. 😋 A+! Kids hung out behind the lifeguard shack and mingled, carrying out typical mischievous (and safe) behavior. Unfortunately there was some confusion about patrons reserving tables and leaving them unoccupied (that’s a big no). One other negataive: After the sand and dust settled and everyone left, the trash and litter left behind on the beach was greater than last year. There were more water bottles, beach chairs, plastic toys and vendors’ specials, food wrappers, tinfoil, Ziploc bags and other garbage than last year. As I drove around last night, observing crews working into the night, house parties rocked the neighborhood. Young kids in love walked with people they just met, catching a glimpse of the red moon together on a bench, or leaving a party wandering into the darkness to find what may or may not become the next unplanned adventure — it all reminded me how this is my last 4th of July in my 20s. I’m no longer young and able to enjoy these things I once did. Yet I find myself at the lifeguard shack every year, greeting old faces, familiar friends, new people, surrounded by lifeguards and guest services colleagues and first responders who I stand by so proudly. It’s hard to face. I’m getting older, and I am not ready for it. But I’ve loved Westport since I was young enough to remember, and fall harder for this town every day. Last night I got to see families and friends enjoy the fireworks as much as I do. And everyone got a kick out of my outfit, which I proudly wear every year. Andrew Colabella celebrates the holiday. 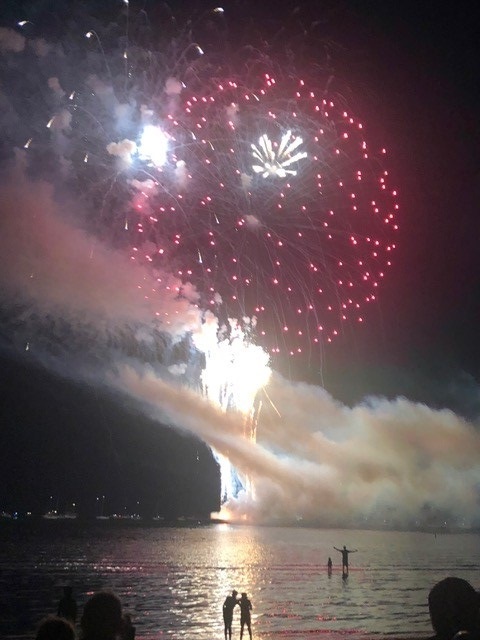 This entry was posted in Beach, People, Westport life and tagged Andrew Colabella, Westport July 4th fireworks, Westport Parks and Recreation Department. Bookmark the permalink. Excellent report, but have to take exception to one comment. “I’m no longer young?” Dude, try being 56. 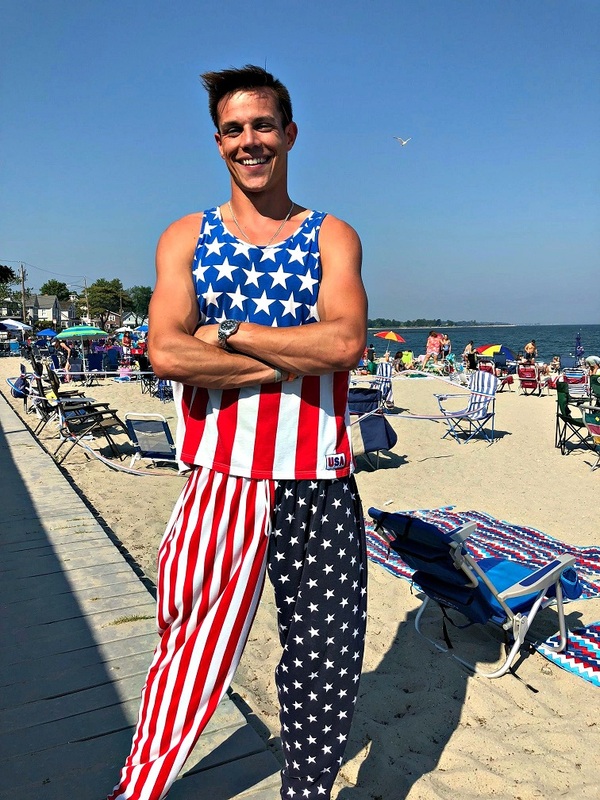 The only thing better than the fireworks was Andrew’s outfit!!! I thought the actual fireworks themselves were a big step up. There were some new effects and the presentation was wonderful. The atmosphere was clear and the wind moved the smoke away. There were also less folks on the beach. I assume people went away for the week. Though still packed, it made for a nice small town feel. I really like this event a lot. And the best part, I don’t have to run it. Thanks to all who did. Nice job. Wonderful report. I almost felt as if I was there. BUT, a BIG one, NO LONGER YOUNG! Think about those of us who just celebrated our 60th, not birthday but graduation from Staples. Then talk about no longer being young. Again it was a wonderful report and brought a big smile and memories. However, not to be a nitpicker I do take exception to one statement he made. The incident regarding saving tables was not “some confusion”, it was a group of very selfish people trying to take advantage of everybody else in town. Wonderful!! Exactly the way a 4th of July celebration should be. Makes me want to think about going next year. Andrew, you always make me smile. Keep being you and don’t sweat the numbers. Dan, you have reported before on the incredible work done by those who clean up. My bike ride takes me through Compo and with the exception to two large dumpsters which were full near the entrance, not a cup or wrapper could be seen. They are town heroes. Couldn’t agree more, it was probably the best Compo 4th of July we’ve been to since moving here. 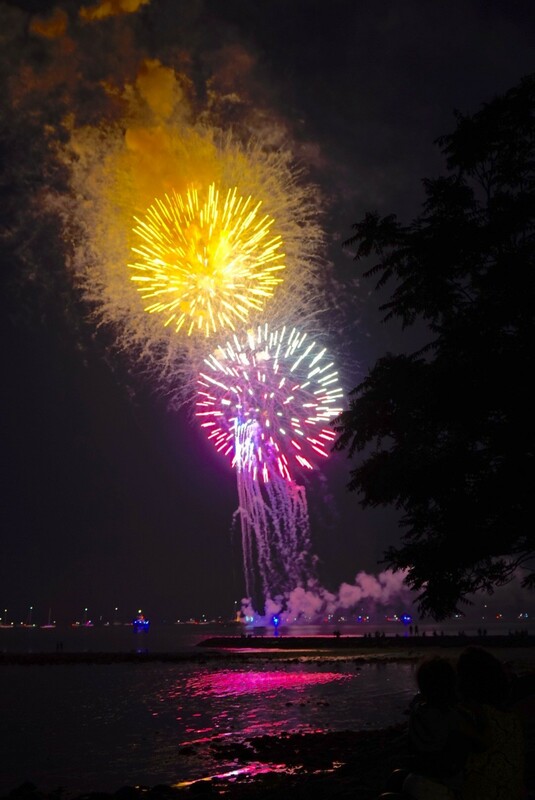 Many thanks to everyone who contributed to a safe and enjoyable evening – P&R and other town staff, public safety officials from Westport and nearby towns, so many others! 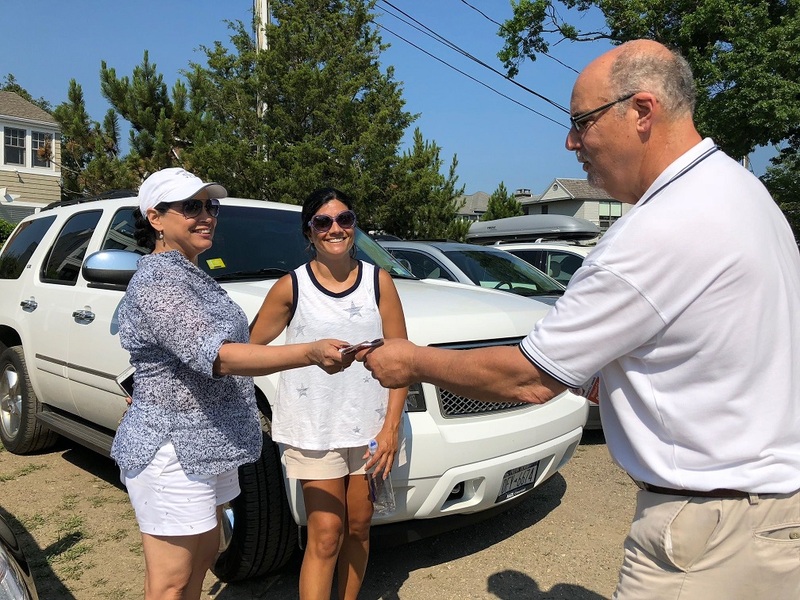 While I can’t complain about the somewhat smaller crowds, I am sad that more tickets weren’t sold to benefit Westport PAL, maybe we can all consider making an extra small contribution to support their great programs. After over 20 years of Compo Fireworks we were shocked that the bathrooms were closed. The Port a Potties were filthy and no lights. Guessing it didn’t bother most people as no one commented. More clean up this year probably due to no nearby garbage cans, we had to walk a mile to find one this year. Otherwise it was great!